Despite the torrents of rain that drenched the New York streets and sidewalks, an impressive crowd followed through with their plans to take in the screening of the iconic play that catapulted it’s writer, the late Amiri Baraka to instant recognition. Baraka wrote Dutchman when he was still known as LeRoi Jones, and the jarring piece about a white woman who seduces a black man on a train made it’s debut at the Cherry Lane Theater in Greenwich Village back in 1964. After taking in the production last night, it’s very clear why this recent revival was necessitated. The story sounds simple enough but the tragic ending will leave you satisfactorily stunned. It also goes without saying that the present racial climate gives Dutchman the ammunition needed to aptly resonate with theatergoers, by serving as a searing reminder that despite our best intentions, not much has changed since the turbulent 60’s. The stirring one-act play garnered an Obie Award for Best American Play in 1964. It was also translated to the big screen in 1967, starring the late Al Freeman, Jr., and Shirley Knight. Now fifty years later, we are being treated to an updated version with actors Sharif Atkins (White Collar, Hawaii, ER) and Ambien Mitchell in the principal roles as Clay and Lula respectively. The performances were indelibly gratifying, with no missed beats and a consistently rising tempo that perfectly heralded the explosive finale. Director Carl Cofield did an impeccable job helming this production. If you are lucky enough to catch Dutchman, it will certainly be a worthwhile experience. It will run from May 3 to May 23 at The Classical Theater of Harlem. Click here for more info. In the meantime check out our interview with director Carl Cofield below. MTB: What initiated this triumphant return of Dutchman – almost fifty years after its impeccable debut? CC: CTH and NBT approached me about directing “Dutchman” months ago. 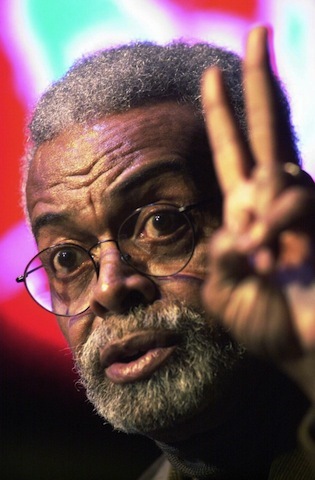 After Amiri Baraka passed away earlier this year, we felt this was the best way to honor him, to re-examine his work and open a dialogue with the community. MTB: The play obviously touches on racial themes in an engagingly jarring way, are you surprised that those issues still resonate today? CC: With the state of current affairs, I think the play still resonates loudly today. With Donald Sterling’s racist remarks and the low premium placed on young Black men’s lives, I don’t think we could have scripted a better time to investigate this important work. It rang true in 1964, today and I fear that it will still resonate 25 years from now. That’s why I wanted this production to have a timeless feel to it, blending elements from the past and current day. MTB: Does your background as both a director and actor give you an edge when it comes to staging ambitious projects like Dutchman, and is there added pressure because of the socio-cultural reference? CC: I think I have some insights into the text. As a young actor in theater school, I played the role of Clay and directed the production (I was an ambitious and crazy young man!). I felt this role spoke to who I was as a young Black man navigating his way in the world. Maintaining a cool demeanor, while a volcano was brewing inside because of the all of the injustices that were happening (Rodney King, et al). Now that I’m older and directing, I have a broader world view that I hope helps shed some insights to the play. MTB: Considering the current climate, what do you hope the production will achieve in terms of the overall reception and lasting impression? CC: My sincere hope, is that the play will foster tough and rigorous conversations about difficult issues and that the play will serve, to quote the rapper KRS-1, as Edutainment.